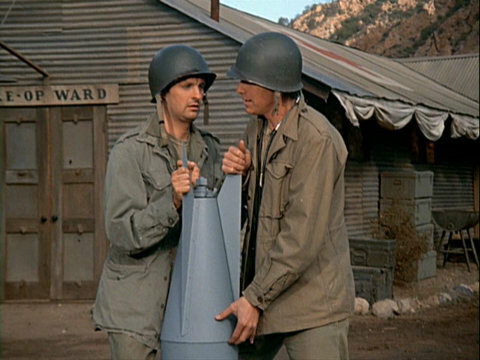 Capsule Summary: Hawkeye and Trapper risk their lives to defuse an unexploded bomb in the compound. There’s really just the one storyline in this episode: the bomb that went thud when it should have gone boom. I’m not sure the Army-Navy game is substantial enough to be considered as a separate storyline. Once the bomb lands, the Army-Navy game unfolds primarily through characters outside the 4077th, used to paint the military as callous and unconcerned with the danger facing the camp. Both Colonel Hersh and Commander Sturner seem to care more about listening to the game than helping the 4077th, although Sturner does eventually come through with instructions to defuse the bomb. Hersh asking Hawkeye to call during half time is absurd. So is his line, “If I don’t hear from you, I’ll understand.” It’s a grim thing to say. About midway through the episode, we’re shown snapshots of characters reacting to the possibility that they might shortly be blown up. Klinger puts on a nice suit so he won’t be die wearing a dress; Margaret and Frank lament not meeting in another time or another place; Colonel Blake tells Radar the story of Tanker Washington; Radar gets up the courage to ask Nurse Hardy to accompany him to the supply tent; and Hawkeye, Trapper, and Ugly John enjoy a poker game. I don’t remember seeing the scene in which Klinger talks to Father Mulcahy while wearing his fancy suit, so I suspect it was cut in syndication. I can understand why it was cut; it doesn’t add much and cutting it doesn’t really affect the rest of the episode. But it does provide some insight into the character of Klinger. Given how brave she thought he was during the initial bombardment, it’s too bad Margaret never found out that Frank passed out from fear when he picked the short match. Speaking of Margaret and Frank, why were they in the “bunker” alongside Colonel Blake and Radar while the bomb was defused? They should have been taking care of the patients. One last thought: if I were in their shoes, I wouldn’t have stopped running the way Hawkeye and Trapper did. They barely put any distance between themselves and the bomb when they hit the dirt. Hawkeye and Trapper perform delicate surgery on the bomb. McClean Stevenson provided the story for this episode, making him the second member of the cast after Alan Alda to contribute to the creation of an episode. Watch closely while Hawkeye, Trapper, and the two nurses are dancing around Colonel Blake’s office. Bobbie Mitchell, the brunette nurse, clearly smacks Alan Alda in the face with her pom-pom. This episode features some unusual music choices starting with the opening theme. It’s cheery and light and was also used in “Sticky Wicket” and “Major Fred C. Dobbs.” Also, the music playing while Hawkeye and Trapper walk toward the bomb sound like something out of an episode of The Twilight Zone. A hilarious outtake exists from this episode in which McLean Stevenson blows a line while telling the story of Tanker Washington. Both Sheila Lauritsen and Bobbie Mitchell make their first credited appearances in this episode. I have to say, this is one of my favorite episodes from the series, I really enjoy it – very humorous and enjoyable. There’s a number of tiny little details throughout that are funny, such as the euphemism of Hawkeye “evacuating” for everybody. Indeed, the scene with Klinger and Father Mulcahy discussing his suit and how he tried to avoid being drafted is cut from syndication . . . and it doesn’t bother me a bit, it’s a really awkward scene. And I too wondered why Hawkeye and Trapper barely ran two feet then hit the dirt. And I’m curious, but were propaganda bombs common during wars? The music was really interesting. In syndication, all Season 1( and 2) episodes use the standard theme song, so this more patriotic-sounding rendition of the theme isn’t heard in reruns. Propaganda “bombs” were bombs only in that they were dropped from aircraft. In urban areas the leaflets/brochures were in flimsy wooden boxes dropped with small parachutes, on hitting the ground the boxes broke apart and wind did the rest. In rural areas it was even simpler, the plane flew low and slow and crewmen dumped the leaflets to fall in the wind and scatter over the countryside. It would be an utter waste to develop an actual bomb to do this. This is a really funny episode. I do quite like it! The scene where Alan Alda is smacked in the face with a pom-pom is hilarious! Brilliant goof! 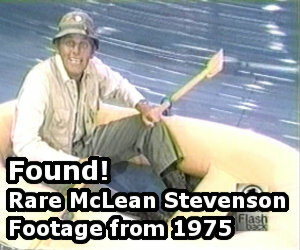 I like McLean Stevenson as a writer. He helped this episode (I like it), and he wrote “The Trial of Henry Blake” which I like. I liked that part, too, Joe! My favorite part of the episode! I was just rewatching this episode, and I find it a little odd that the laugh track is heard when Henry instructs Hawkeye and Trapper to remove the bomb’s tail assembly. Not sure why that’s supposed to be funny. The reasons it’s funny are, first, “Tail assembly” sounds risque and Henry forgets to tell them to remove the fuse before cutting the wires. In all, a wacky early episode.